USA 1996 Curbow Petite 33 Fret Bass Guitar. Yo. Do you know where I could get a 33 fret curbow? I´ve searching but nothing so far. By the way, where´d you get that beauty? Cheers. Hi Alex, this bass has a slightly groovy story. It belonged to the infamous Ed Roman. Here it is...still shown on his site (he got the year wrong). http://edroman.com/detail_sheets/curbow_bass_d264.html He passed away a few years back, but the store is back in business and the custom shop is up and running. It is still in Las Vegas (about 1 1/2 hours from me). He refused to sell it due to an interesting story about who he got it from. He kept it for so many reasons, the final reason being that he wanted to make copies of it and try to make it even better. The ones that he made and that they still make are AMAZING! He did some "improvements" and you can have custom improvements to suit you. So, where you can get a REAL ONE.....I honestly don't know. Here are Ed's: http://www.edroman.com/guitars/abstract/caesar.html Don't crap your pants when you see these! lol But, my bass was scanned and used as the template for all of these. It is truly the finest Curbow I've laid my hands on (we all say that about our own gear), but..........lol. 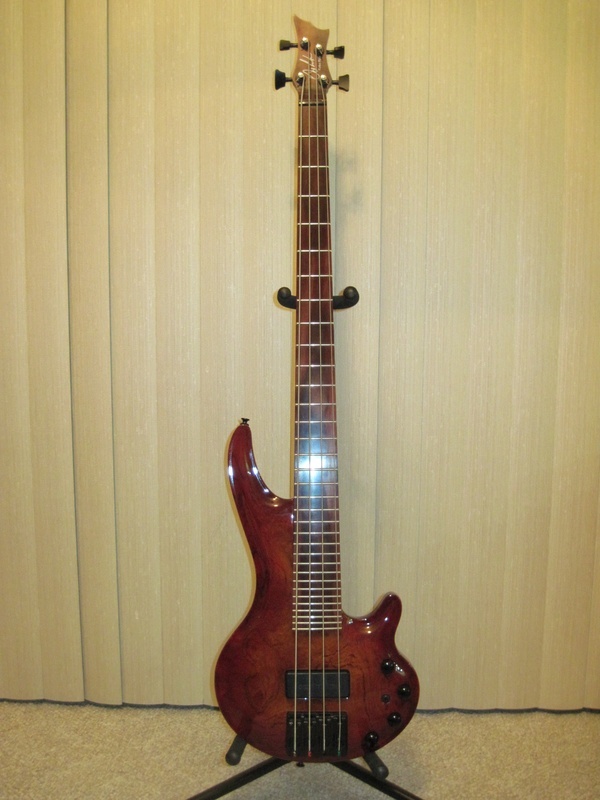 Lastly, I ended up having to shell out $10,000.00 for this bass. Yep, I paid about $6,500.00 more than they got for. Was it worth it? Yep, to me it was. The story (documented and photographed) that came with it was also worth it to me and it will be to someone else as well when it comes time to sell. If you're ever around and want to TRY to talk me out of it, or just check it out or gig it a bit, just let me know. I contacted you awhile back to see if you wanted to sell your Curbow XT-33! Anyway,I have a Curbow International Exotic Petite 5-string that I am selling and wondered if you might be interested.I used to work for Greg Curbow and have owned well over twenty of them! !